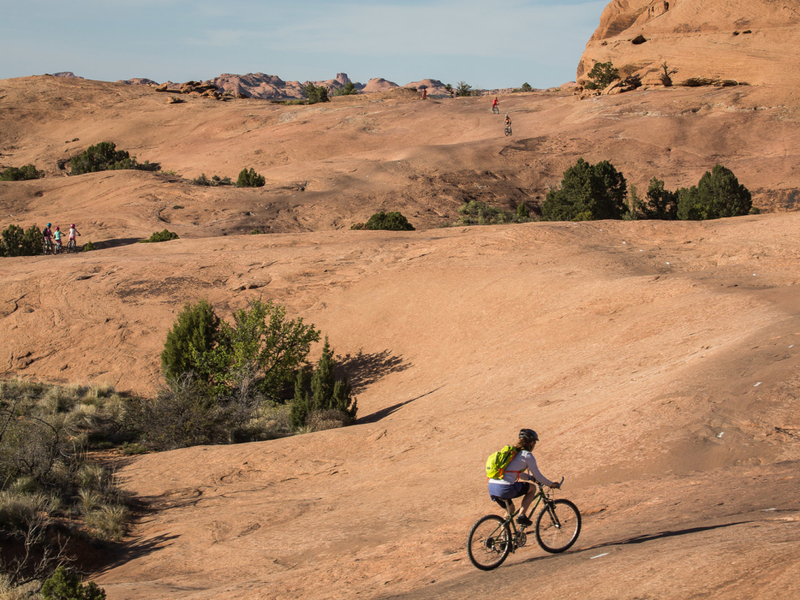 The Slickrock Bike Trail is 9.5-miles of slickrock riding with sections of sand. This area is infamous and part of what put Moab on the adventure sports map. The Slickrock Bike Trail is an adventure. Slickrock - think solidified sand - is insanely grippy, it possible to ride steepness and angles on slickrock that defy logic. It is super fun riding, but it is extremely technical and falls are unforgiving. There is a 1.7-mile practice loop, which you should do before committing to the 9.5-mile ride. If you are strong, a skilled biker and have plenty of water, slickrock trail is a super amount of fun. Slickrock riding is just goofy. It takes a skill level and agility to learn how to play on it, but then it is fun. The proper equipment- a working mountain bike that fits you - is an important first step. A two sizes too big touring bike, for example, will leave you black and blue. The trail is well marked with paint swaths and the black of tire treads having been worn off bikes over decades. Experienced mountain bikers in great shape will love this trail. This ride is technical and demanding in agility. It is rated “difficult” by Moab standards. It is not recommended for novice riders or for young children. 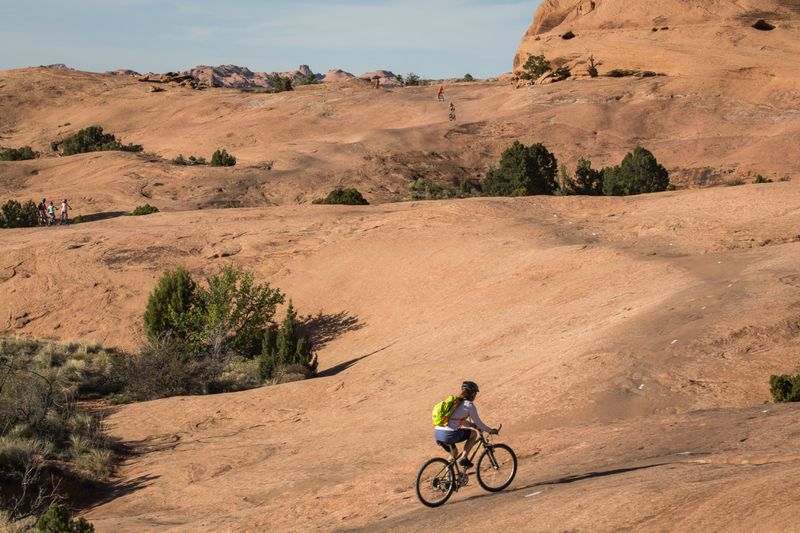 The best time to ride slickrock trail is spring and fall, the middle of a warm winter day or crack of dawn, off the trail by the time the heat hits in summer. Plan to take adequate water, food, a small bike repair kit, headlamp and a jacket. Helmets are a must, gloves will help the pads of your hands not get ripped up by the rough slickrock when you fall. Go east on 100 north from the main drag of town. Go .5 miles and take a right onto 400 East. Go another .5 miles and take a left at Dave’s Corner Market, onto Millcreek Drive. Go another .5 miles to stop sign. Go straight up the hill following signs. The Entrance booth is 2.5 miles up the road. The parking area for the Slickrock Bike Trail is .5 miles past the Entrance Station. The entrance cost is $5 a vehicle, $2 for a shuttle driver or $20 for an annual pass.